This is the NUMBER 1 issue in the 2006, Mississauga election - Hazel McCallion's - AGE !!!! The voters million dollar gamble! Same OLD - Same OLD! The Mayor of Mississauga - Hazel McCallion - is 85 years old and as the term of office for a Municipal official, such as Mayor, has been extended from 3 years to 4 and that would make her 89 years old, just months from 90 years at its end. So there are reasonable concerns that she will not be able to even live that long. If this was a horse race, it is like saying it is reasonable to bet on the oldest horse, when there are serious doubts it will even be able to make it around the track. But what does that mean in dollars & cents, which has been the Mayor's main theme for past elections - she doesn't waste money or has duplication! How about the duplication resulting from having to have a by-election in a year or so as Hazel has to step down for health reasons, has a more serious car accident or just drops dead? The estimated cost of a by-election will be $1,000,000 to Mississauga taxpayers - image how much daycare that could buy! - maybe it is EGO? Maybe she does not want to end up like Ex-Prime Minister - Jean Chretien, who found himself before hearings regarding his unlawful activates while in office and destroyed his political legacy. 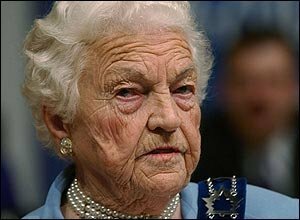 Hazel McCallion is before the courts in a $ 20 million lawsuit and likely she will lose. This what we know of and can tell you of, one thing is for sure - she doesn't want to be alive and not in office, as the person taking over will dig up the truth and of course blame her for whatever is going wrong or can't be done. That alone would kill her! Hazel McCallion has had no election platform other than the cult of personality. How acceptable is that in a Democracy? as well as, how mentally fit she is likely to be at the end of the term. Another aspect of McCallion AGE issues is that she has questionable control of her car and still wants to driver her self to her functions, even if she has had too much to drink! These make Hazel McCallion a liability to the City of Mississauga! What happens if she runs down some children, will we still be so proud that she does her own driving? Another issue is her mind. What is its real state? Well she thinks there is a "coup" out to get her. When you listen to what she is saying in regards to how she helped eliminate Mississauga's special Democratic tradition - Public Question Period - she sounds confused, another Councillor telling her what to say and generally makes no sense. Is she lying, confused or after 40 years as a politician just doesn't know the fact from fiction? Event witnessed Oct. 25, 2006 - the Mayor in noticeable decline! not like drunk but like from medication. Now that people are looking closely at the Mayor, they are seeing the signs.